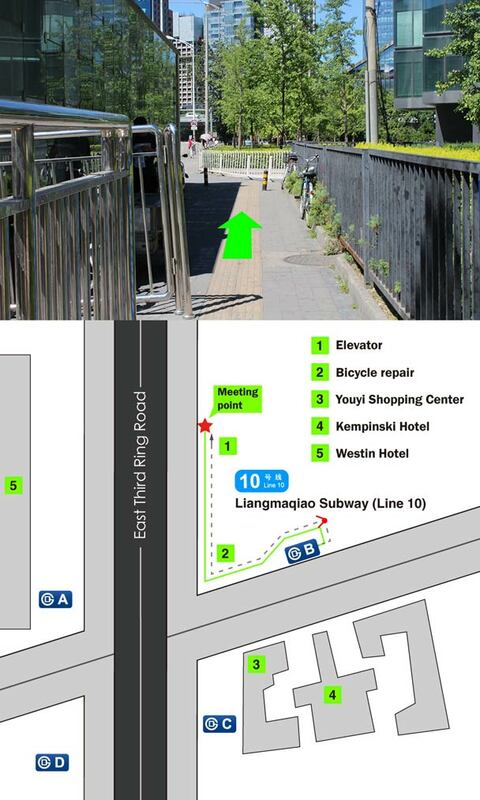 For the hikes in Beijing, we have two main meeting points. The main meeting point is outside the Starbucks Coffee at the "Lido Place", part of the Metropark Lido Hotel. 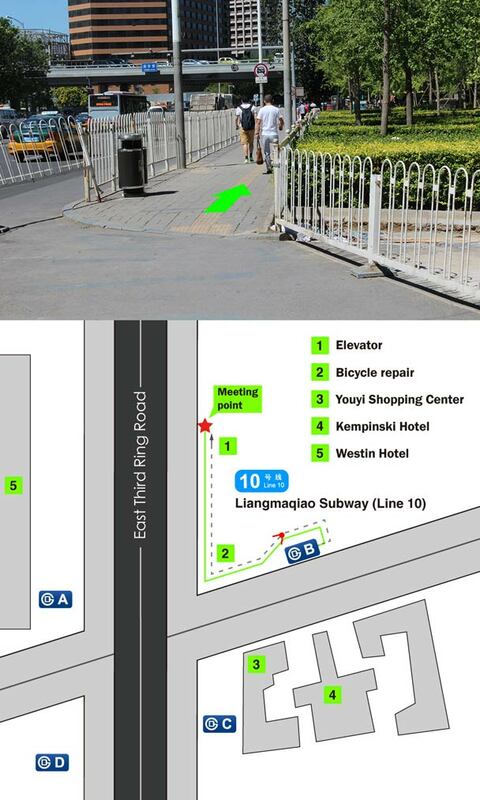 The other meeting point is near the Liangmaqiao subway station, on Line 10. Lido Place, at the Metropark Lido Hotel. Starbucks is on the right side of the building. 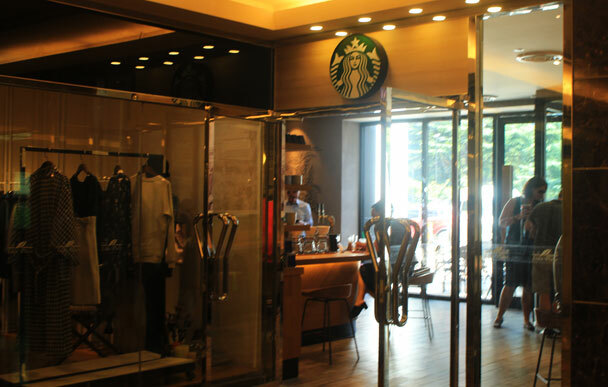 Click here to see photos of the Starbucks entrance, where our guides will be waiting. We meet up at the Starbucks at the Lido Place, part of the Metropark Lido Hotel. This is our main pickup point – we've been meeting here since 2001! Taxi drivers know the hotel as Lìdū Fàndiàn. 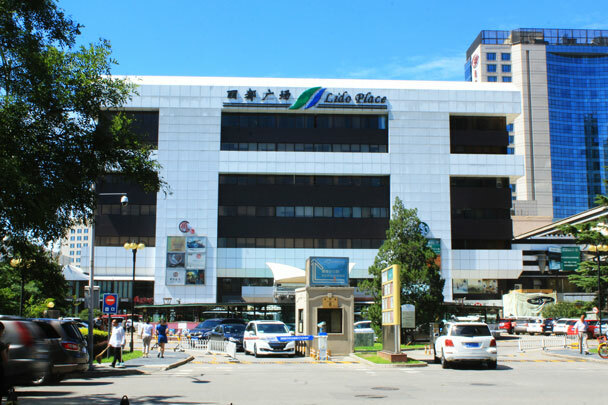 The Starbucks is located by the square (called Lido Place) at the south-east of the hotel complex: the Lìdū Guāngchǎng. Click here to view a printable/downloadable address card for the Metropark Lido Hotel. 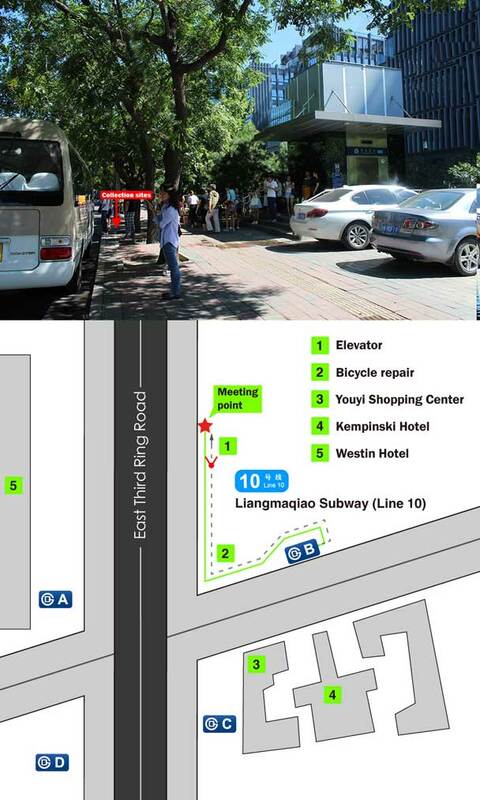 The address of the hotel is 6 Jiǎngtái Lù. 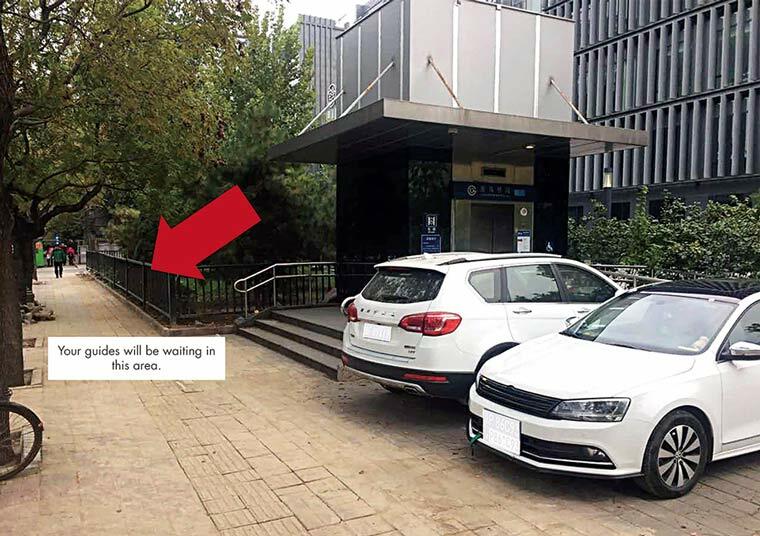 Parking is available and will cost about 60 RMB per day. There's a shed to lock up your bike. 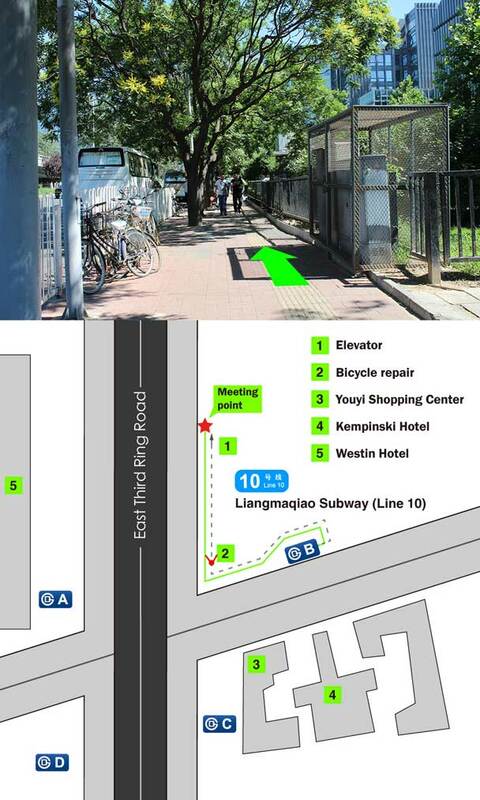 The closest major bus stop is Lìdū Fàndiàn Station. Search LiDuFanDian or 丽都店站 on www.bjbus.com. Look for the Lido Metropark Hotel signs on the south-west side of the road, which will lead you to the hotel lobby. The Starbucks is at the other end of the building. 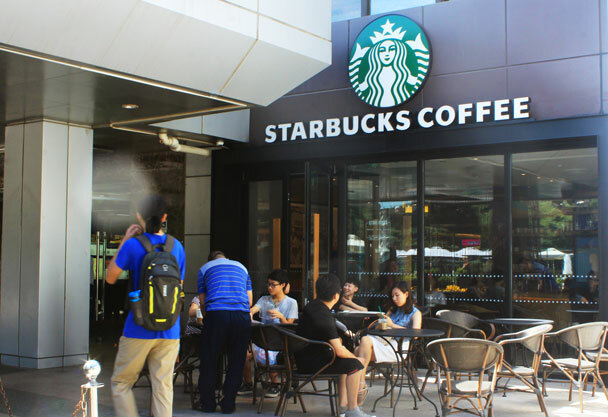 We meet at the Starbucks Coffee at the Metropark Lido Hotel's Lido Place itself, not the other branch by the Jenny Wang’s shop around the corner. If you can see a set of traffic lights, you're at the wrong one! 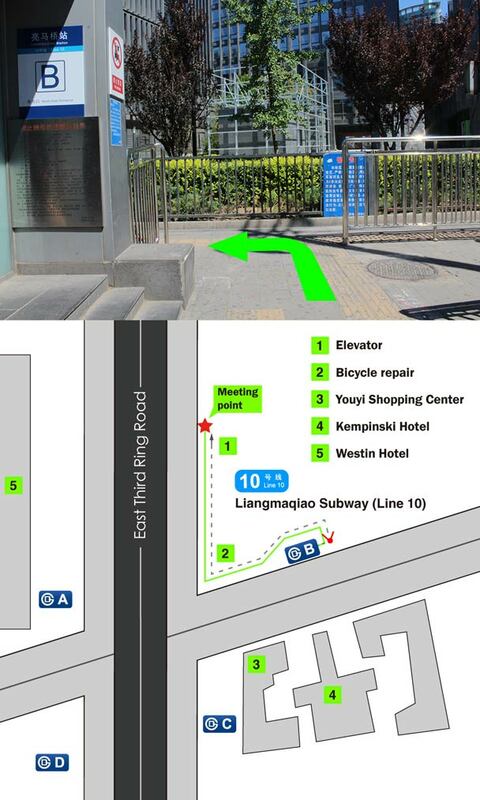 Click to see a step-by-step guide to finding our meeting point at the Liangmaqiao subway area. 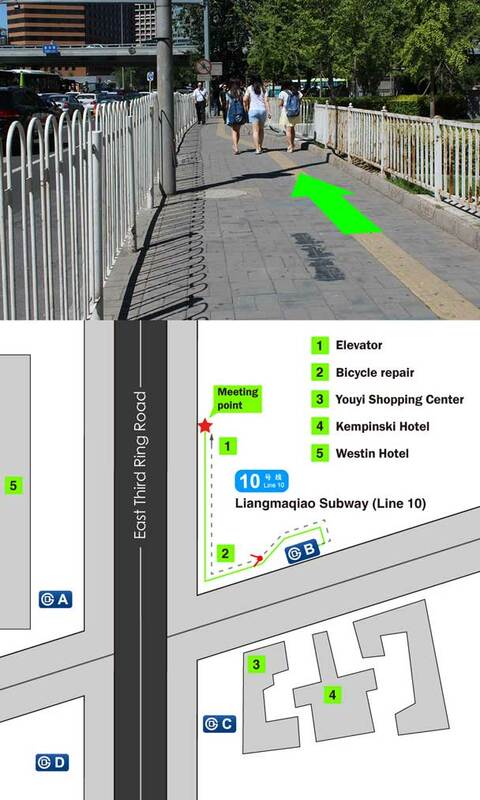 Come out of Exit B of the Liangmaqiao Station on Line 10. It's the northeast exit. Coming out of Exit B, make a 180° turn to your left. 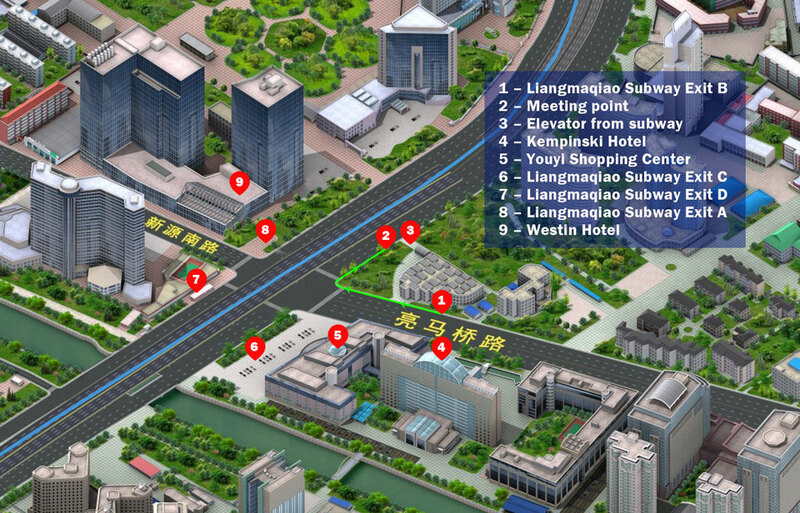 Follow the sidewalk towards the traffic lights at the big bridge and the Third Ring Road. Keep walking towards the traffic lights - you'll see a little bike repair stall. Make a right turn at the little magazine stand. Don't cross over the road. Walk up towards the trees and the taxi rank. Keep walking past the taxi rank. There may be other vehicles parked here. The bus and our guides will be waiting for you right around here! Call the guide if you can't find us (phone number will have been supplied with your booking), and have a great hike! 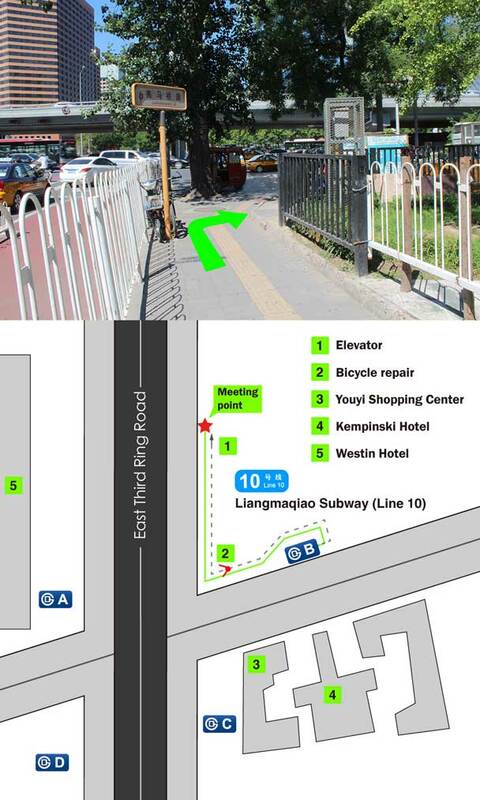 We meet close by to Exit B of the Liangmaqiao Station on Subway Line 10. There’s no room for the bus to wait right outside the exit, but after a short stroll towards the Third Ring Road you'll be in the right place. Get yourself to the northeast corner of the big Yansha Bridge intersection. If the big sign of the Westin Hotel is directly opposite you and on the other side of the road you're in the right place. Click here to view a printable/downloadable address card for the subway area pickup. 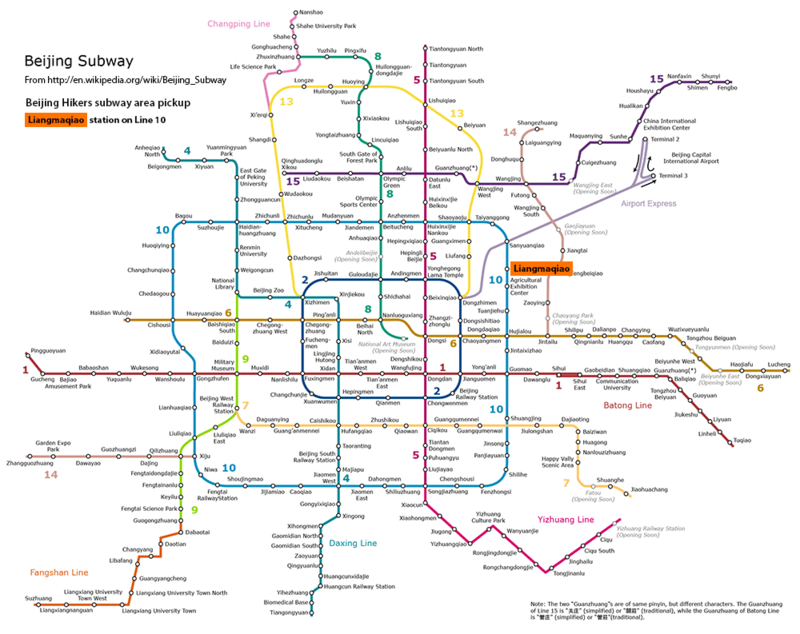 The closest major bus stop is either of the four Yansha Qiao stops, all around five minutes’ walk. Search YanShaQiao or 燕莎桥 on www.bjbus.com. On some maps this station is named Liangmahe. 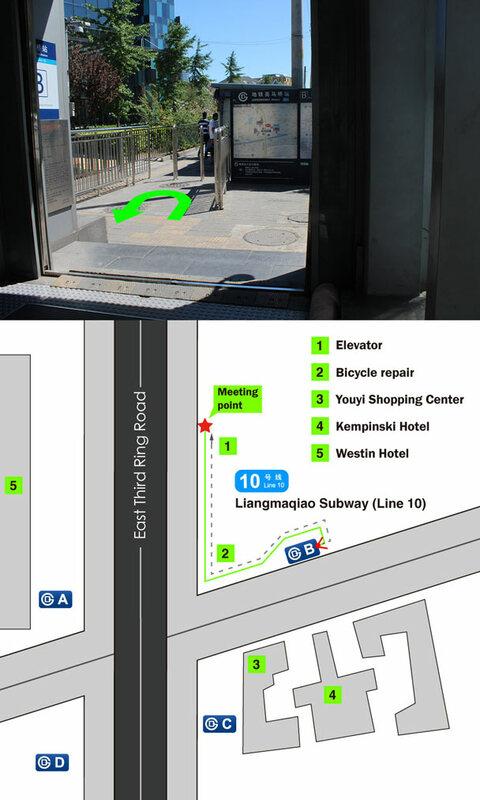 The main landmark for our meeting point is the elevator that comes up from the subway. The bus will wait on the side of the road there, facing north, on the north-east corner of the intersection. 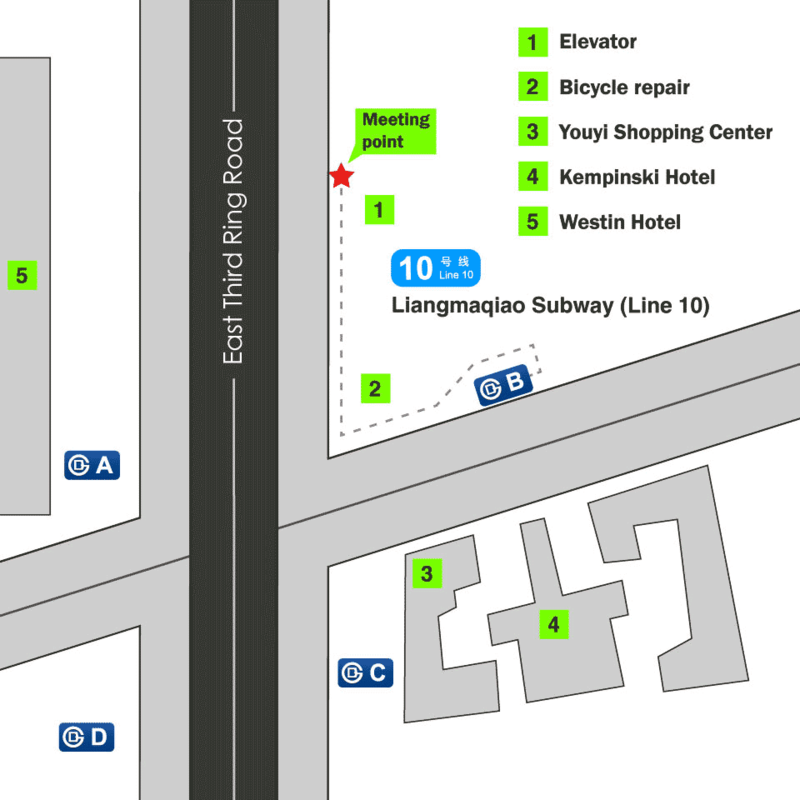 The Kempinski Hotel and Lufthansa Center are on the south-east corner of the intersection. The Westin Hotel is on the north-west corner of the intersection. Click here to see a photo of the general area where the guides and bus will be waiting for you.